Ah, what joy seeing colors in my food! These two spreads are my immediate go-to’s whenever I’m on a savory-food-phase. Aren’t they just so puuurdy? I hope you could try to make at least one of these because they’re absolutely yummy! I like a lot of types of bread but sourdough rye holds a dear place in my heart so it’s the one I used here. From the name itself, it has a hint of sourness when fresh but once toasted, it delivers a beautiful sweetish scent and it just goes so well with that avocado spread! But if you’re not a fan of sourdough, use whatever non-white bread that you prefer. These spreads are perfect to make when you know that you’re about to have a busy day. Turn them into dips and serve with roast vegetables even! They’re awesome for a savory breakfast, quick bites or a light lunch. But if you’ve got the appetite, why not have both spreads in one mean sandwich -- or two? YUM fest in your mouth. 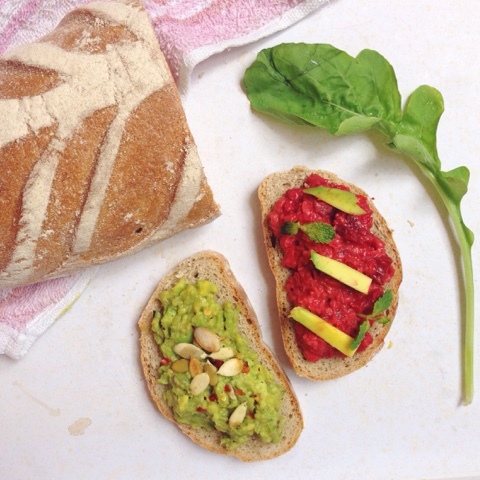 In a small bowl, simply mash avocado meat with a fork, scoop onto the toast, and top with the rest of the ingredients. Blend all the ingredients in a food processor/high-speed blender and process until smooth.